From Pie Town to Yum Yum: Weird and Wacky Place Names Across the United States by Debbie Herman. Review: Have you ever thought of visiting Scratch Ankle, Alabama? How about Chilly, Idaho? Debbie Herman introduces readers to some of the most bizarre place names in the United States in From Pie Town to Yum Yum: Weird and Wacky Place Names Across the United States. After perusing Herman's book, readers will open their minds to some little-known, yet fascinating places that help shape America. Herman begins her book with an overview of toponymy - the study of place names - and a brief history of the naming of towns along with the explanation that the book tries to "provide a range of reasons given for a place name, but doesn't claim to have given every one." However, From Pie Town to Yum Yum is quite an impressive list! Every state is included in the book with a highlighted city name along with other wacky town names in the state. Included in the state's information is an overview of the town name, brief information about the state, a fun map, the "lay of the land" and even ideas for a road trip! The information is really quite interesting - for example Eureka, California "meaning 'I found it!' in Greek, was so named in 1850 for the cry of gold miners striking gold." From Pie Town to Yum Yum is simply fun. It is filled with entertaining, trivial information that will liven up any conversation! Plus Linda Sarah Goldman has added simple, yet clever illustrations that compliment the text perfectly. From Pie Town to Yum Yum is certainly not a book to sit down and read cover to cover, but rather it is perfect to have around on rainy days or road trips - or even on a coffee table to pick up and read whenever the minutes allow. 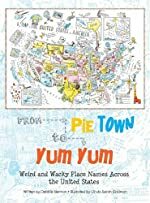 We would like to thank Kane Miller for providing a copy of From Pie Town to Yum Yum: Weird and Wacky Place Names Across the United States for this review. Have you read From Pie Town to Yum Yum: Weird and Wacky Place Names Across the United States? How would you rate it?